We had the pleasure to attend the Ottawa Miniature Gamer's Flames of War tournament, or OMG TOurny for short. When we had Skirmish a few months back, 4 or 5 guys from OMG came out, and now we return the favor. It was Late War, 1500 pts, not theatre-specific. I decided to not take the German list I have been playing for 3 months, and bring the King Tiger list instead. In fact, I had this planned for many months, and to "spring" it on folks. However, when I got there and saw that there was a strong contingent of players from CFB Petawawa (Army base 2 hours out). This meant a LOT of AOP's and Commonwealth artillery, which naturally crush top armor. There was also an army with 11 Churchills, which I would face game 1! Here are some more shots of the tables. The venue was awesome, the OMG guys play at this location twice a month, and play not just FoW, but Napoleonics, etc. Price couldn't be beat: 10 bucks, which covered the room, 2 slices of Pizzas, a drink, plus there was prize support. Man, THATS bang for your buck. Many thanks go out to Jeff, Todd and the OMG guys for putting on such a great event, we will be back for sure! I took some shots of armies and so on, but the lighting was pretty bad, and my Flash is super harsh. However I HAD to get a shot of this army from a Petawawa guy, I think Bob's (who is running the Petawawa tourney in November) Check out that sweet sherman bridge layer objective, and the field hospital! Here is my video from the event. I wanted to do Interview-style like the WWPD boys did, but should have done it outside like they did, so it isn't as loud! I elected to take a bit of film from the game between Chris and I, but it was so one sided.. we skipped to the end. Take a look around the site, and if you could, please add a few quick words to the Remembering the Heroes section. Thanks! Friday Night Fights is over again for another week and I got enough photos for an actual report! German Deployment. Nebs, Light Tanks and one pio platoon in Reserves. So I picked up this game Wednesday night, PC version, and have been loving it thus far. its all the little things that they got right that clinches this game as one of the best FPS games I have ever played. I won;t do a full on review, or any of that, as there are millions of them on the 'Net already, instead Im simply going to list a few gems that really makes this game for me. Scope Glint: I was playing the shipyard dock map, forget name, and was trying to figure out what the keys for Prone, and Toss Ammo crates was, when I hear the Whizz/Crack of a bullet flying right near my head. I back up behind cover of a shipping container, and then peek out and scan a rubble heap. At the last second, I catch a white flash, like a far away camera flash, and Boom Headshot Im down. The guy that got me had a SVD sniper rifle, and what I had seen was the sunlight off his scope. Total Saving Private Ryan moment for me there. Sound: I'm not a big audio guy, in that i don;t have several hundred bucks in a suround sound thing going on, just my PC speakers and bassbox, but I am talking about quality. I am a huge plane nerd, and to see and hear proper Doppler effect on aircraft was really cool. For those not in the know, an aircraft coming in hot, in this case, an F-18 diving down, you could barely hear it, since it is approaching the speed of sound. As it goes by, you hear what is dubbed "the ripping' sound, as all the sound waves hit you all together, then as the aircraft climbs out, the sound goes down to a very low, dull roar, as the sound waves are far apart, as he is climbing up at speed. This is all in the game. Also, the first game I have seen that has the proper sound of an A-10. One of the few combat aircraft with Turbofan engines, it has a distinct sound, and for once, a game got it right. Speed of Sound: As alluded above, this game even takes into account the speed of sound of a projectile travelling faster than the speed of sound. Therefore, if you see a T-90 wreck blowing up in the distance, there is slight delay in the sound reaching you. Bullets whizz by first, THEN you hear the crack of the shot. There are no ambient gunfire sounds I have heard so far.. every far-off gunshot, which is muffled to simulate distance, is someone firing a gun in the game. Balance. It isn;t perfect, but my biggest gripe with BF2 in particular was base-bombing with planes. In BC2 it was with choppers. Vehicles now seem a bit rarer to me, they are reclassified, and are limitted to certain maps. For example, some maps will only allow Scout helicopters, or Light Vehicles, while others will have full on AFV's, attack helicopters, Ground Attack jets, and some have fighters. They seem to have made it harder to survive hits in a plane, and there are more options for shooting stuff down. An early unlock for AFVs is a one-shot AA missile, while an unlock for the Engineer has a shoulder mounted SAM.. I had a teamate use one to shoot down an AH-64. So all in all, seems steps have been taken to curb aircraft. Best option seems to fly a scout chopper behind enemy lines (Like Damarvand map) and have squad mates spawn on your chopper and para off. I might put up more after I play some when I get home from a movie tonite, but that would cut into my BF3 time! So now we are up to 30 Vid's linked. only 21 more to go! AAR 46, Tris' Panzer Gren's vs Chris' 2nd SS Das Reich.. 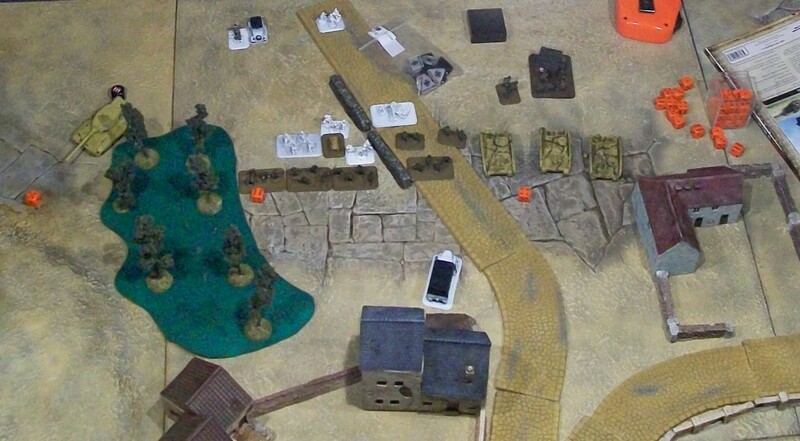 Historical Refight: US 2nd AD (Marty) vs my 21.Panzers, Operation Cobra. Oh, and he had some Stuarts!! AAR 50, I cant believe its 50 already! will be posted tomorrow night hopefully, then the tournament video, and we should be all caught up. So we just had the OMG tournament, I will be posting interview-style vids later, I also have a backlog of AAR's, and I'm sure the lads will post their post-tournament thoughts at some point. And Drew from CoveringFire is sure to post pics and AAR of our nailbiter. Now, prior to the tournament, some folks, whether by choice or couldnt get stuff painted, where switching lists to heavy tanks/lots of tanks, so I spilled the beans Friday, so people didn't think I was a D-Bag and tailored my list to a meta or something.. that I had been planning this all along. Then we get to the tournament, and I see a TONNE of killer lists that could easily take mine down. So thats why I didn;t take the list I've been playing non stop with for 2 months! Anyways, expect some more posts now that the busy, pre-tournament period is done. (above) A hint as to one of the things we find in the next part of the museum.. Think I can paint these on 15mm sleeves??? Adam and I went hunting for the elusive Panzer Faust.. and we see a tonne of other cool stuff.. we were like kids in a candy store! CHeck the close-ups of damage on the Stug III though, that was pretty intense! Stuart and Universal Carrier. We found a more deadly UC inside teh display area though.. Video at the bottom, Enjoy! My second game from last weeks FNF (Friday Night Fights) turned out to be a blue on blue match between my PanzerGrenadiers and Clockwerks PanzerLehr at 1500pts. I am deployed at the bottom of the screen (south) in the Top Left and Bottom Right quadrants. My Jagdpanzers in reserve. Clockwerks Deployed 1.PzrGren, Pak40s (looking down the road) and 80mm Mortars with 2. PzrGren, Pumas, and Pzr IV H platoons in reserve. Skip on after the break to see my AARs against "Tickron"! (above) Adam beat me to it, finishing his army yesterday, but I just finished mine also: sdKz 182, aka PanzerVIB, aka Tiger II, completed, finally! I worked a bit on the Monastery I won at Skirmish for Best Painted.. it is pre painted but the rubble looked pretty bad, so I embellished a little. However, the real announcement is I am slowly working on having ALL of our Flames of War Battle Report Videos on the AAR page (top below title up there), and I also have another 65+ 40k and WFB ones after we are done. Keep in mind, these are our first ten games of Flames of War ever! Its neat though to look back and see the progress we have made in the past 10 months, with terrain and with models. I will try and put in another 10 this week sometime, but enjoy! UPDATE: all AAR's up to our large multiplayer game at the local Con are now up. Part of the reason why I take on painting projects, and I'll go out on a limb to say that the reason why almost everyone takes them on, is because of the incredible sense of accomplishment that comes when you have finished a major milestone in an army's collection. Oct. 16th. So with a full 16 days ahead of schedule I am finished my army and love the way that my Gepanzerte Panzergrendadierkompanie looks. I do have 2 German objective markers to work on but I don't really count them. Really knowing nothing about army composition for FoW or Germans for that fact, I kind of went for something that would feel aggressive and would have a lot of pretty toys to look at. Some troops, some vehicles, tanks and some finesse to the army. Panzer IV and replacing them with a Heavy Morter Platoon and some Pak40s for a more static list) it does seem to perform wonderfully. Getting the camoflage right was a bit of a trick initially. I wasn't really sure how to go about doing to traditional late war German camo scheme for vehicles considering that I didn't have an airbrush, but Dennis had recommended Dirty John's post on WWPD and that changed everything. Thanks John, and Dennis! wild fury (at least in my mind). So far the Brummbars tend to be either totally incredible or do nothing at all. They are the slow, implacable advance element to my otherwise speedy, bloodthirsty army. My Panzer IVs have a great deal of firepower and the Panzergrenadiers are a very solid component to nearly any army IMHO. Anyhow, so there we go. All done. Might modify but we'll see how the rest of the playtesting continues.